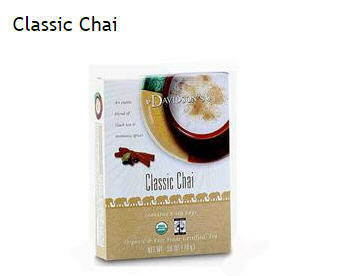 Chai Tea is a black tea infused with south Asian spices. The base ingredients of cinnamon, ginger, clove and cardamon are said to aid in heart health, proper digestion and to assist in lowering blood sugar. The black pepper, present in this classic blend assists the pancreas and boots enzymes to speed digestion of proteins. The cinnamon and ginger, long revered as natural cures for digestive issues come together to round out this tea. With the intent on these teas to aid in stomach and digestive health, I have read that using one cup after a meal can help calm an irritable bowel and when added with ice or milk this can be a great replacement for soft drinks. The Classic Chai tea is amazing. The flavors are full and bold. When the water fills the cup the rich aroma of pepper fills the air and you are engulfed in the fiery magic that is a strong classic chai tea. The ginger and cinnamon are present as full supporting flavors to provide a ideal backdrop for this wonderful tea.